Sleek, bold and powerful, the Synyster Gates Autographed Acoustic Guitar Gloss Black is an instrument like no other. NOTE: PERSONALLY SIGNED BY SYNYSTER GATES HIMSELF. WHILE SUPPLIES LAST. Sound better than ever before with the Synyster Gates 'SYN J' Acoustic guitar. Featured in Synyster Gates’ custom line of personal guitars, this phenomenal instrument is one of the same models Synyster performs with on stage with Avenged Sevenfold. Boasting a Mahogany and solid Spruce body construction, this guitar is built to look and sound great on stage. A solid DoveTail design paired with a unique gothic style makes this guitar a must-have for players of every age and skill level. With an electronic Fishman Sonicore Piezo pickup, preamp and controls like volume, bass, treble and more, the SYN J Acoustic is ideal for plugging and recording or projecting on stage. This guitar even comes with its own built-in tuner to help you take the stage with confidence. Boasting Rosewood construction, the Synyster Gates 'SYN J' Acoustic’s fretboard includes unique Pearloid Gothic Crosses, a Death Bat and Syn’s custom signature. Finished in a sleek black gloss, this is the perfect acoustic guitar for players of any skill level wanting to take their look and sound to the next level. 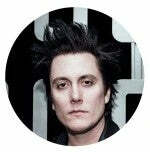 NOTE: Synyster Gates Guitars can only be shipped within the USA. International orders are not possible at this time. This acoustic is my tip of the hat to the late legend Johnny Cash. This is as classy of a look as it gets in my not-so-humble opinion. The sound is incredibly full-bodied with a brilliant high end that you get from the gloss finish. I loved playing this acoustic at the Grammy Museum because it really suited the two songs I played it on, “As Tears Go By” by The Rolling Stones and “Exist” by yours truly and the boys. The rhythm sound projects so nicely and it has an amazing playability to it. I highly recommend this one to all of you singer/songwriters out there. It’s inspiring to play!